Crumbs and Cookies: メロンマカロン melon macarons. Still, I was so happy to be able to churn out beautiful looking shells, inside and out. Before this batch, I encountered a few failures. Pancake-flat. Hollow. Gummy insides. I didn't know what could have gone wrong. I thought I had already conquered the macaron? I was ready to throw in the towel and give the french method a shot. 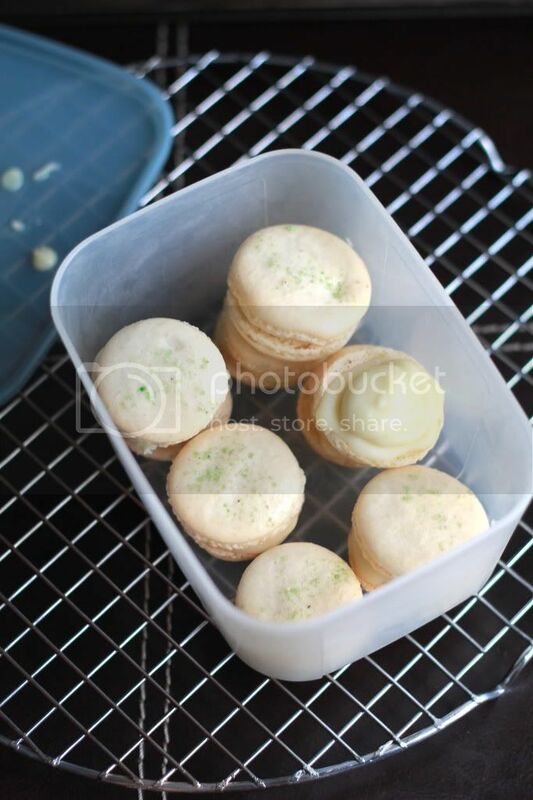 You see, I was trying to make green macarons to suit the melon theme so I added a few drops to the egg whites that were going to be whipped instead of the one that is just going to be mixed with the almonds and icing sugar. The theory, I reasoned with myself, is that the colouring doesn't get as evenly mixed if I just dump it in the almond-icing sugar bowl. Maybe I should elaborate a little more. I use the italian meringue method, but I do one thing differently. I don't mix the egg white, almonds and icing sugar together into a paste before folding in the whipped egg whites. I find that in the effort to loosen that stiff paste and integrate the meringue homogeneously, I lose track of the consistency of the batter, resulting in flatter macarons than I would have liked. That's why if I add the colouring to the almond-icing sugar bowl, the colouring won't get mixed in at all until I add in the meringue. And when I finally mix it in, I would have already reached the perfect consistency but there would be streaks of colouring. Anyway, the reason why I failed was because I added the colouring into the egg whites that were going to be whipped. What happened was once I whipped them to soft peaks and poured in the sugar syrup, they deflated like phhhhoooooffffff..... until it became a soupy mess. If you've made an italian meringue before, the sugar syrup wouldn't do that to the egg whites. In fact, it would only make them stronger, thicker and shinier. It wasn't a question about the temperature of the sugar syrup or the stage at which I stopped beating the egg whites before adding the syrup. It was the colouring's fault. The colouring I used, I later found out, has... vegetable fat. Oh. Em. Freaking. Gee. Yes. If you add fat to egg whites, they won't beat up into meringues. That's why my italian meringue never formed! It was such a eureka moment! So, the moral of the story is Don't Ever Ever Ever Add Colouring Into Your Egg Whites That Are Going To Be Beaten. Or DEEEACIYEWTAGTBB for short. Pierre Herme was right all along. I hope this helps some of you who just can't seem to achieve that successful macaron. Good luck!